Did your mother always tell you to dress up for the camera? I mean, people won't take you seriously if you don't have your hair and makeup done, right? They'll judge you and nobody will want to work with you, right? There is no rule, especially in today’s on-call video world, that says we need to win a freaking beauty contest for others to see our faces online or to get them to listen to what we have to share. Men on the other hand, god love them, don't think twice before getting on camera. They don’t care what they look like before slamming their face in front of their iphone. A thought comes to them that they know will help their clients move forward and BOOM they flip the camera on, jump in front of it and off they go. We aren’t men, but there's something to be learned there. Maybe, just maybe, you don't have to be perfect to be worthy of being seen. When you tell me, “But, Jess, I don’t feel good about being on camera to do a livestream or create videos for my YouTube channel unless I’ve done my makeup first,” you know what you are really saying? You’re telling me you’re not good enough. What this is really about is our desire to be perceived as perfect. Like we're someone who's got it all together and figured out. So while we're in the bathroom primping and prepping our followers and clients are waiting for some kind of help. Truth is that you ARE good enough. More than that. You are worthy of sharing your expertise, your insights, your information, your thoughts, your whatever if it’s going to help your clients. And, guess what? 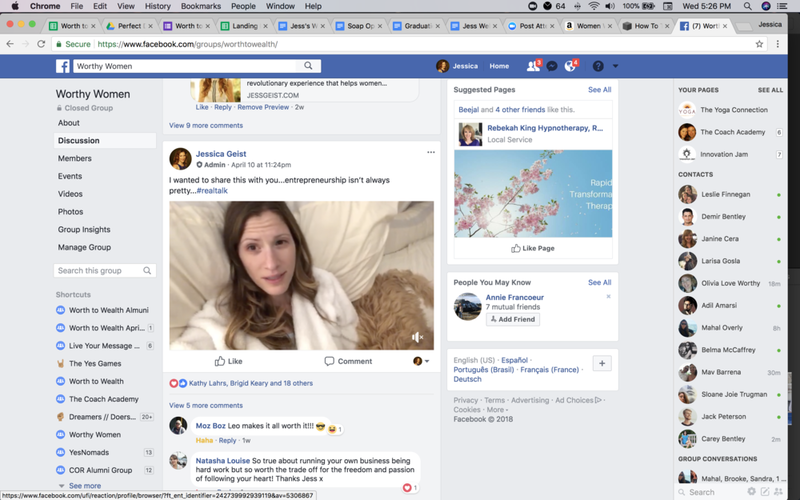 Putting yourself out there on video is a fabulous way to gain new followers and to turn prospects and looky-loos into clients!! You’ve spend years honing your craft. You know stuff that no one else does... or you deliver the information in a fresh, new way. If you want to grow your business, you must serve others. You have to share what’s in your head with the masses. Hey, think I don’t practice what I preach? Oh, lady, you’d be wrong. Well, I've experimented with this in my own business and the results have been interesting. It turns out that it doesn't matter. That’s from a really cool video I did recently in my Worthy Women Facebook group. That’s right. I had a spur-of-the-moment insight I needed to share with my friends, fans and followers. What would have happened had I waited until my hair and makeup looked great? I would have lost the momentum and, worse yet, lost the moment. I have vowed not to concern myself with the way I look. The reason I create video content is so I can share what’s between my ears with those who can benefit from it. The way I figure things, it’s taken me years and years to learn everything I know in my industry so I can help others achieve what I have achieved. Freedom. Success. A great income. The business you have always wanted. But you have to dump the doubt and fear around getting on camera!! If you don’t believe that I’m just like the guys... and I just jump on camera au-natural you need to become a part of my special Worthy Women tribe!